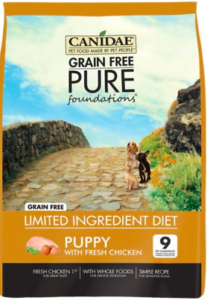 These are just a few of the reasons that this brand has made its mark on the dog food industry and has gained enormous popularity with dog owners everywhere. 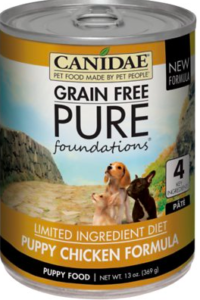 Here is a list of a number of these products below including both the dry and wet forms of the Canidae dog food brand. This recipe is veterinarian formulated that is a great source of nutrition for dogs of all ages, size and breed. Fresh, healthy ingredients with added vitamins and minerals. Includes antioxidants, probiotics and omega fatty acids for optimal health. Added minerals, vitamins and probiotics. No grains, wheat or soy. Easy, gentle digestion that provides a great taste. Veterinarian formulated to ensure a quality recipe. Healthy protein derived from chicken meal. No need to transition from one recipe to the next, as it is ideal for puppies to seniors. 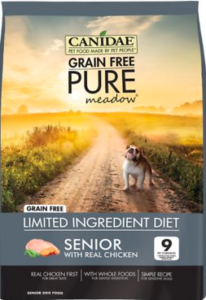 Formulated for senior and less active dogs. 27% less fat than the multi-protein formulas. Formulated for the senior dog. Recipe only includes 9 ingredients to assist with the sensitivity of some dogs. Healthy recipe with the puppy in mind. Formulated with only 9 ingredients. Great for the pup with sensitivity. Free of corn, wheat or soy. Healthy chicken is first ingredient. Formulated for the senior or less active dog. Easy on the digestion system. No gluten, grains, antibiotics, hormones, corn, wheat or soy. Consists of just 9 ingredients. Formulated with fish sources including salmon, mackerel, whitefish, pollock and tuna. 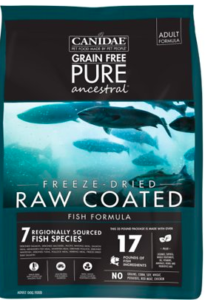 Raw coated with freeze-dried raw salmon. Suitable for the adult dog. No grains, corn, wheat, soy, potatoes, chicken or red meat. Contains a nutritional trio of probiotics, antioxidants and omega 6 and 3 fatty acids. Although this is not an exclusive list, you should have a pretty good idea of what the Candae dry dog food has to offer. 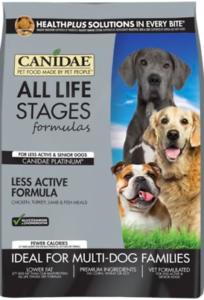 Formulas designed for all life-cycles, pups, seniors, less active, and overweight dogs can be found in the Candae brand. 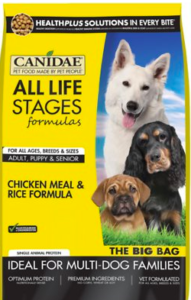 For those interested in additional options, you can find the Canidae recipes here. Healthy protein provided by chicken, lamb and fish. Slow cooked in broth with quality ingredients. Comes in a case of 12 cans. Made with limited ingredients which helps with sensitivities. Lamb is the first ingredient along with chicken and turkey which provides a great source of protein. Simmered in broth, making it near impossible for dogs to resist. No wheat, corn, soy, or grain. Quality protein supplied with lamb, turkey and chicken. Complete nutrition for all dogs. Simmered in broth which provides a taste that dogs can’t resist. Great choice for sensitive dogs. Formulated for the puppy in the house. Provides complete nutrition as well as being sensitive to the pup. Simmered in broth to provide a great taste. Quality protein provided with chicken. Once again, the 4 canned versions listed above are just a few of the recipes offered by the Canidae brand. If you are interested in the other canned recipes you can do so by clicking here. 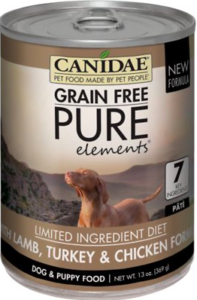 Canidae produces a great number of dog food products, so it is important for you to understand that the ingredients may differ from one recipe to the next. Read the ingredient label to make sure the recipe will meet the needs of your pet. Dog Food Advisor, a giant in the evaluation of pet food, gives the Canidae grain-free recipes a 4 out of 5 stars review. 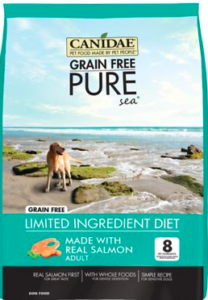 In 2012, Canidae voluntarily recalled a large number of products due to potential Salmonella. None of their product ingredients are sourced from China. Because of its popularity and use of quality ingredients, expect to pay a little more than other brands. 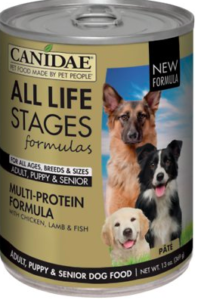 Canidae is an independent and family owned business. 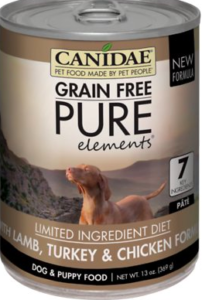 When considering the quality ingredients that are used in their recipes, the Canidae brand is certainly one to consider. In addition to these healthy ingredients, Canidae has designed and formulated recipes to specific needs of your dogs. Puppies to seniors, you can find a recipe that will meet the needs of your four-legged companion. 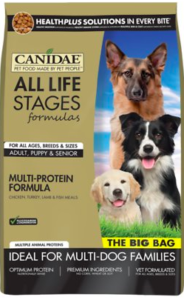 You now have the information on quite a few of the Canidae products, as well as a reputable site to purchase. I hope this information will provide you with details associated with these specific products and make the decision process much easier. Thank you for visiting and I wish the best to you and your pet. The content provided on this site is for informational purposes only. 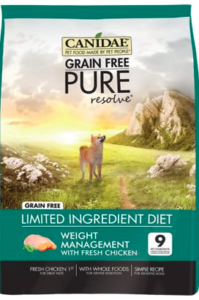 Although I have spent years researching and studying the benefits of healthy dog food, it should not replace the recommendation or advice of veterinarians or pet nutritionists. 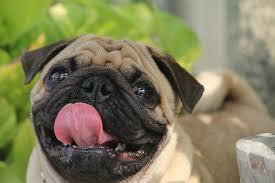 These people are indeed professionals and should be consulted for further advice in choosing a nutritional pet diet. 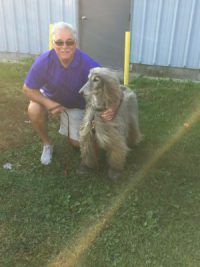 eathealthydoggy.com assumes no responsibility or liability for the use or misuse of what’s written on this site. Please consult a professional as mentioned above before taking any course of action in relation to the health and safety of your pet.